Megaliths, medieval dungeons and Calypso’s Cave – The Maltese Islands are positively mythic. The narrow meandering streets of their towns and villages are crowded with Renaissance cathedrals and Baroque palaces. As the countryside is dotted with the oldest known human structures in the world, the Islands have rightly been described as an open-air museum. This legacy, unique in the Mediterranean, is reflected in the country’s national architecture and collections. There are so many areas of heritage and culture to be explored – the 16th century masterpiece Grandmasters’ Palace, which is now parliament, the “Sacra Infermeria”, which is now a fully equipped conference centre, the St. James Centre for Creativity – a superbly restored fortification where contemporary works of art are exhibited against the original rough-textured walls and rediscovered spaces. With these buildings, past and present blend into an enduring and admirable lesson in the art of living. The arts have always played a large role in Maltese culture and continue to do so with cultural events occurring frequently. The National Museum of Fine Arts, housed in an exuberant Rococo building dating from the 1570’s, exhibits some magnificent art, ranging from the early Renaissance to modern times. Both present day established and budding artists are encouraged through support and exhibitions in public areas to celebrate their efforts. There is almost always an exhibition of some kind running. Theatre and music are also very popular in the Islands. A variety of theatres and open-air venues offer an enormous ensemble of plays, musicals, operas and both classical and modern music concerts. The Flag of Malta (Maltese: Bandiera ta’ Malta) is a basic bi-colour, with white in the hoist and red in the fly: colours from the blazon of the arms of Malta. Tradition states that the colours of the flag were given to Malta by Count Roger of Sicily, in 1091. The banner of Count Roger was a chequered red and white flag and he gave a set from this banner. A key stronghold during the Crusades, much of the heraldry of Malta is influenced by the colours and devices of the Knights of Malta. Their badge was the characteristic Maltese cross, and their arms were a white cross on a red field. 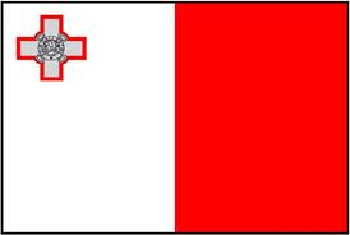 From these colours came the red and white shield that was used during Malta’s colonial period. In the upper hoist corner (in the canton of the white field) is the George Cross (showing a design of St. George and the Dragon), outlined in red, with the motto “For Gallantry” encircling the cross. The honour was awarded in 1942 by King George VI to the entire Maltese population, for their exceptional bravery and gallantry during World War II. In 1964, the blue canton on which the cross was originally placed was replaced by a red fimbriation. This flag was adopted upon Malta’s being granted dominion status within the British Empire, on 21 September 1964. The dominion of Malta existed until 1971 when Malta became a republic, although the flag remained the same. The Maltese national flag is unique in bearing a decoration from another country, in this case the United Kingdom and this raised controversy in the years following Malta’s independence.